Today we walked from our campsite to Tintagel - we think about 12 miles. However, with all the ups and downs of typical coastal path it was a very tough walk, and we hadn't gone far when we started to notice the typical Cornish slate built cottages. 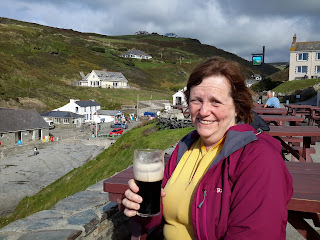 Our plan included meeting Val and John again for lunch in Tintagel, but this turned out to be very late indeed, but lucky the weather is continuing to be kind with long spells of sunshine and only short ones of blustery rain. The scenery along the way was absolutely breathtaking, and on numerous occasions we found ourselves stopping to just gaze in wonder - we had to stop because in places the track was quite rough, and walking and looking were not in our best interests. After we'd been walking for about an hour we came to the first big hills, first down and then up - it certainly made us puff, and then we hadn't gone much further when we came to a 2nd big drop. Here, along with steep slopes there were over 200 steps to reach the rock strewn beach off Trebarwith Strand. We pottered right down onto the shore line through rock channels that had been hewn out by the sea, and we quickly found a boulder to sit on while we had our coffee and lemon curd croissants. And we certainly needed the energy from them because next we had to climb back up out of the ravine and continue on our way towards Tintagel. Further along we came across several of the many disused slate mines where a sign boards informed us that ‘the landscape has been utterly transformed by the hand of man, and the cliff tops and faces reshaped over hundreds of years by the intensive quarrying of slate’ As long ago as the early fifteenth century the high quality Upper Devonian slate in the cliffs attracted the attention of quarry-men keen to extract the sedimentary rock for building and roofing. During the last 500 years up to ten quarries were worked for slate on the cliffs around Tintagel, although most have not been operated within living memory the remains of the workings are still evident. Further along still we came across Tintagel Parish Church, St Materiana, and from there it wasn't long before we were entering the streets of Tintagel itself. The streets of the hamlet are filled with eateries, ice cream stalls and numerous gift shops selling goods related to King Arthur and Merlin, who if legend is to be believed, frequented these parts in times gone by. Unfortunately, the village has been over commercialised and now the best thing about it, for me, was the glorious coastal scenery, and of course the bakery that sells the most wonderful Cornish Pasties. And it was here that we met Val and John for lunch. We all indulged in said pasties (we had beef and stilton) and they were absolutely delicious, and after licking the last morsels of grease from our fingers we retired to Val and John’s van for a very refreshing cuppa before setting off via Tintagel Castle and retracing our steps back to the Tardis. The castle is owned by English Heritage but there didn’t seem to be much left of it to view, so that, along with the time (4ish), and the £7 entrance fee, put us off going in and we just had a look at it as we rejoined the coastal path and headed back. By now we were growing a bit weary, so on the way back we needed plenty of little rests, but even so we made quite good time until we came to the beach where we'd stopped earlier. Now, the tide was racing in, and it was chasing lots of people back up onto the rocks so we didn't stop at the bottom because we still had the 200 + steps to face. Instead we brought a cold drink, climbed the steps and when we reached the top we enjoyed it while watching the surfers riding the waves. We then toddled onto the next big down and up valley, but again we were good and saved our hot chocolate and doughnuts until we'd climbed the hill - and then we met this little fella! Later still John and I discussed how fast we thought we'd walked - it was quite hard to say, but in the end we decided it was probably about 1 big hill an hour!! We made it home about 6.30 - just in time to sit with a very welcome and refreshing cider, and with the last rays of the evening sun shining on us, we both agreed it had been a very challenging but a spectacular and exhilarating walk. Today we decided to cycle to Boscastle but we didn’t set off until about 11am because before then there were several very sharp and heavy showers. That said, we were very lucky because once we left the Tardis the rain cleared up and we didn’t get wet at all. We cycled along mostly quite narrow lanes which undulated a bit, but when we were nearly at Boscastle the road nosedived and dropped down for the next 2 miles. It was lovely going down, but what goes down has to come back up!! so we had that to look forward to later. When we arrived in the village we dismounted and had a walk along the fast flowing river which was the waterway that had contributed to the flooding 11 yrs ago. Flash floods caused by exceptional rainfall - over a month’s rain fell in just two hours - devastated the village, destroying homes and businesses. Apparently the force of the water washed 100 cars out to sea, wiped out around 1,000 trees and deposited 20 years worth of river sediment in the village on Monday 16th August 2004. Luckily, no lives were lost but the flood was the worst in living memory, but to see the village now you would never know that all of the above had occurred. We walked to the mouth of the harbour and sat on the rocks while we ate our picnic lunch, while watching the sea washing into a small cave and then being jettisoned out again under force causing plumes of spray in which a seal played. Later we walked around the village to collect essential supplies for our tea, the lady who owned our campsite had baked us some fruit scones, so of cause we needed jam and clotted cream to go with them! Anyway, we could no longer put of our ascent out of Boscastle so we took of our jackets and got on with it, and it really wasn't to bad. 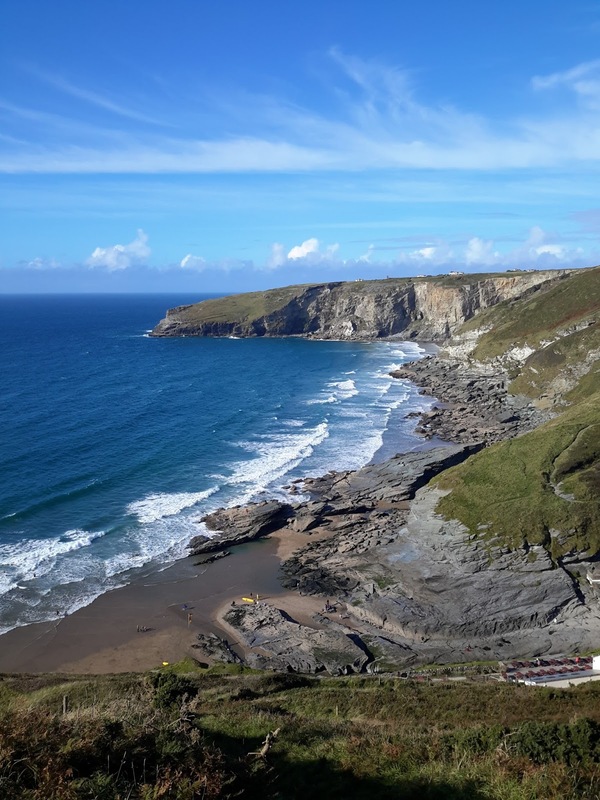 The slope ramped up gently so we managed quite nicely without to much huffing and puffing, and then continued on our way back through Tintagel and on to Trebarwith Strand beach which we had visited yesterday - remember - the one with 201 steps. Well this time we avoided the steps, but instead it was down another long hill. When we got to the bottom we had a big decision to make - was it to be ice cream or was it to be a pint. The latter won and we made our way to the pub that overlooked the beach for our treat. I nipped inside to order the drinks - John wanted cider and I had decided on Guiness, but they only had Strongbow and he isn't overly keen on that, so before ordering I went back to check if this would be ok. But instead of asking said question I told him that ‘they'd stopped serving’ he fell for it hook, line and sinker, and the look on his face was a picture I missed taking (ha ha ha)! He quickly sussed he’d been had and justified it by saying he will get me back soon!! We enjoyed our drinks while watching the surfers etc, and then proceeded to wear off the calories by cycling back up the hill and then back to the Tardis for more calories (John says it’s carbohydrate replacement therapy!) in the form of our indulgent cream tea. Not much to report today as it was a moving day. We travelled about 50 miles further south down to a small campsite called Beacon Cottage Farm just outside St Agnes, but on the way we stopped of at Hollywell Bay, and it was stunning. The golden sands and dunes stretched for about a mile, and it’s gentle sloping sands provided a wonderful playground for beach lovers and surfers alike. John and I took a walk along the sands and explored a cave that we found along the way. Unfortunately we hadn't got a torch so we were limited to how far we could enter, but we trekked in by a good 25 yards, and although the ceiling became quite low it seemed to continue further back for a good way. After our walk we had a quick lunch in the National Trust car park (avoiding paying a car parking fee), and then continued on to our new home for the next 4 nights. The site is associated with ACSI - a club of which we are members, so instead of it costing £22 a night we have pitched for just £14 - a saving of £32! Additionally, I think this site is one of the most beautiful setting we have found since going ‘Full Time’, and at the moment we are sat outside our van overlooking, what the map describes as the Celtic Sea, watching the sun slowly sinking into it - I think maybe we are in heaven! Over the next few days we will explore this area more, but we already know that St Agnes and the surrounding Cornish Coast are designated as an Area of Outstanding Natural Beauty, and additionally 'A World Heritage Site' so I'm sure we're in for a very special treat.